If you take a walk through Upper Hadden Hall you will note that the Hall of Nations continues to grow into a colourful and meaningful representation of our LCS community. The 42 flags hanging in the hall represent our students enrolled for the 2018/19 school year and are a reminder of how unfortunate we are to enjoy the learning that comes with being part of such a diverse community. December and January have offered many opportunities to celebrate culture at LCS. On December 6 we continued the tradition of celebrating Saint Nicholas Day as a school community. A festive and traditional dinner was prepared by students and Aramark staff, complete with decorations, candies, oranges, stollen and delicious Butterplatzchen baked by our own students. The evening offered a chance to celebrate this storied European tradition and learn about the history and customs of the day. Visitors to campus as well as staff and students were immediately put in the holiday spirit by the beautiful decorations on campus. Keeping with our newest tradition, Windows of the World gave the opportunity for the International Club to decorate the windows in the Chapel Narthex with decorations that represented traditions from around the world. This year, windows were filled traditional decorations representing Germany, Mexico, Japan, Ukraine and a window dedicated to celebrating Hanukkah. When students arrived back to campus rested from the break, the celebrations continued with a Ukrainian Cooking workshop held on January 13, the Eve of the "Old New Year" which is the first day of the Orthodox calendar. 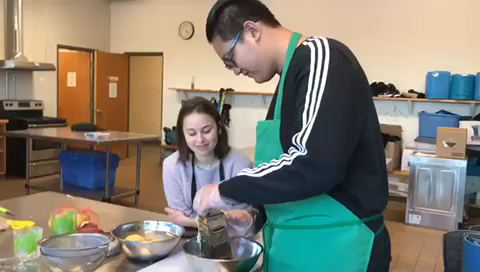 Grade 10 student Sofia Onopriienko and her mother Janny led a group of students in the making of traditional Ukrainian dishes that included pierogies and deruny. Students learned how to make these delicious dishes, listened to stories about Ukrainian culture, enjoyed festive music and shared traditions from their home countries. Many students remarked on the similarities between the traditions of making Chinese dumplings and the art of making pierogies, reminding us all how our cultures are often more similar than they are different and we take a part of every place we visit with us. This past week, three students visited the Lakefield Golden Years Club to share with the local Lakefield community about their home countries—Hong Kong, Mexico and China. With so many countries represented at LCS we have many opportunities to celebrate. Stay tuned for coverage of future events including Chinese Food and Culture Festival, Walk Around the World and more.